Nose: Barley, honey, and slight caramel notes dominate along with a soft, sweet peat. A very light layer of nail varnish, seaweed, and sea spray are also there. Although it’s definitely got a solid nose, it’s not harsh in anyway – absolutely no alcohol on the nose at all. Palate: On the palate, the peat, seaweed, and salt really come to the fore, but most of the other notes from the nose – the barley, honey, and caramel are still lurking in the background. Apart from the peat, the roles have really been switch from the nose – although fortunately there is not varnish coming through on the palate. The palate grows slowly as the whisky heads to the back of your mouth – big on the peat and salty seaweed for the entire journey, dark caramel notes increase from the very beginning before morphing into a sweet honey-barley combo as it gets going. Mouthfeel: A little bit oily when you first take a sip, the mouthfeel quickly turns very dry as it coats your tongue in its super lush and thick, almost chewy, goodness. Finish: Nothing about this whisky is in a hurry, and the finish is no exception. Lasting for quite a while, the finish is practically a continuation of the palate, with a sweet honey-barley combo dancing hand-in-hand with some powerful peat and seaweed notes. Unusually for a whisky with such a prominent display of peat, it’s not brash in any way; there’s lots of it (absolute bucket-loads of it), but it’s soft and almost sweet. The sweet smoke that is evident throughout the entire whisky just continues on for an eternity. Balance: The balance in this whisky is absolutely superb. Unlike the 5.1, which was solidly consistent throughout the entire whisky, the 7.1 is a slowly (super slowly) evolving journey starting with the nose, and rolling casually on through the palate to the finish – with a mouthfeel that matches the slow and steady pace that the rest of the whisky offers. There are no sharp turns in this journey, it’s just a steady continuation from one component to the next. Octomore 7.1 – Jim McEwan’s final stand. The release of Octomore 7.1 was held back to coincide with Jim’s departure announcement, and what a chapter to end the book of his 52 years in the whisky industry with – this whisky is fantastic. The latest x.1 release in this cult series is peated to 208ppm – the second most heavily peated whisky after the Octomore 6.3; and was bottled at 59.5%ABV with no added colouring, and no chill-filtration. Like all of the x.1 Octomore releases, the 7.1 was aged for 5 years in ex-Bourbon American oak barrels, and warehoused in Bruichladdich’s warehouses on the west coast of Islay. This whisky is fascinating. It’s like a long, slow, tightly-gripping hug from a peat-burning campfire that just doesn’t want to let you go. 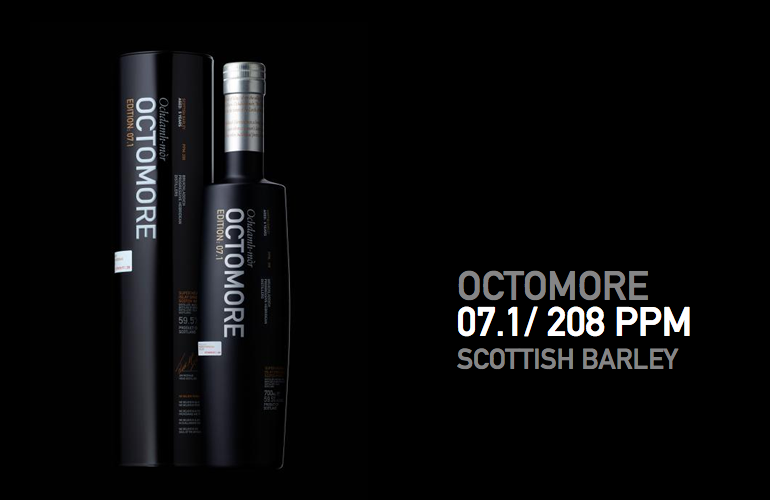 I was sure after the wonder that was the 5.1 that we would be lucky to see an x.1 Octomore release that would compare; and after the release of the 6.1, I was even more sure of that. I was wrong. The Octomore 7.1 is just so elegant and refined, full of flavour nuances that don’t sit still – yet not at all restless; slowly going about it’s business not caring what anyone thinks because it knows it’s is spectacular. Not quite as bowl-me-over amazing as the 7.3, lacking the extra layer of fruitiness that the wine-cask finishing brought to that one, and perhaps not quite as vibrant in feel either; the 7.1 is as a whole package, just stunning. No one particular part of it (although the mouthfeel is just so damn fine) is not bettered by at least one other Octomore, but the balance and the poise of this whisky as a whole package is unrivalled. If you don’t already have a bottle of the Octomore 7.1, I highly recommend you grab one now, whilst they are still the current edition and easy to lay your mits on – it is without a doubt one of the better whiskies in my cupboard.